When it comes time to move house it can be a trying time for you and your family. It is hard enough as the hustle and bustle begins to hold it all together, and you already know what is happening! Packing up everything in your home and preparing to set out to a new place can be a traumatic time for your dog. As the world they know suddenly becomes a field of more than usual activity, packing boxes, and that nervous tension in the air as everyone in the family tries to not become too stressed. 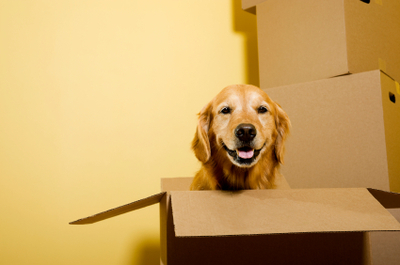 There are a few things that you can do to help your dog survive the new move and remain in high spirits! One of the most surprising things I have recently learned came from an Adelaide Removalist Company's blog. The basic idea here is that you get a calming pheromone which helps put your dog at ease. In the build up to the time to move home, as all of the anxiety begins, you douse your pets safe spot, or bedding with the pheromone. The pheromone helps to keep them calm and feeling relaxed. Then as you arrive at our new home, you place the pheromone in their new 'safe place'. The fact that the familiar smell or scent is at both places helps them ease into the transitioning of a new place to live! If this is something you think would help you with your dog, then you can organise a booking with your local vet and they will be able to help you out!